By Nuel Suji – President of the Nigeria Football Federation (NFF) Amaju Melvin Pinnick, has been re-elected for a second term in office. He won a landslide victory for another four years after scoring 34 votes out of the 44 polled by the NFF Congress members. His rivals: Aminu Maigari and Taiwo Ogunjobi scored eight and two votes respectively. While the fourth candidate, Chinedu Okoye got no vote. 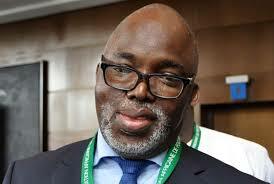 Mr. Pinnick’s campaign thrust had been to score a second-term mandate to enable complete the job of making Nigeria football become self-reliant. The NFF president, who also doubles as the 1st Vice President of the Confederation of Africa Football (CAF), is by this election also to lead NFF to the 2022 World Cup in Qatar. Also returned to office is the 1st Vice President of NFF, Seyi Akinwunmi, who defeated Sunday Dele-Ajayi 41-2. One vote was voided.